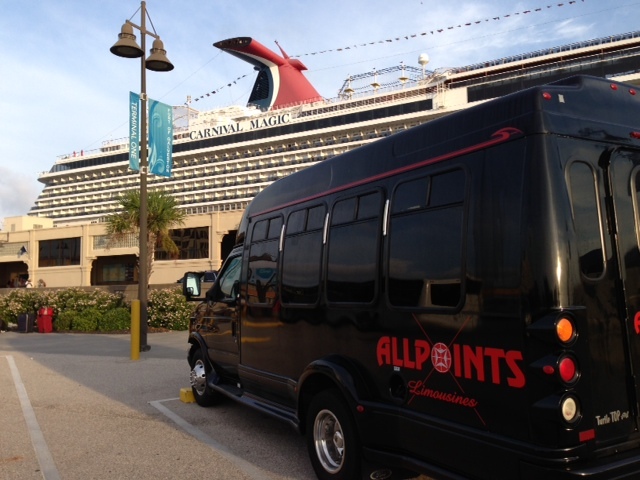 Allpoints Limousines has begun group service to and from the Port of Galveston cruise ship terminal from the Dallas and Fort Worth Area. Using our 10 passenger Executive Vans we will pick up your group in the Dallas or Fort Worth Area and drive them directly to the Galveston Cruise Terminal. When the ship returns we are waiting to take your group directly back home. Full details are available at www.DFWtoGalvestonCruiseBus.com. The Executive Van holds up to ten passengers in comfort with individual leather captain’s chairs with arm rests. There is ample room for baggage in the rear of the bus. There are also two ice bins for bottled water and refreshments so bring your goodies. Pop a DVD in the TV or play your favorite, on your device, on our Boise sound system. We charge $900.00 each way for a total of $1800.00 round trip. A little extra if it requires two overnight stays for the driver. In most cases the driver will go down the night before you return so as to be fresh for the drive back. When the price of 10 airline tickets to Houston and the price of ground tranfers from Houston to Galveston are added up or prices are quite reasonable. Our typical transfer takes about six hours. Consider the time involved in driving to Love Field, parking, flying, finding a shuttle then driving to Galveston. There is a parking charge at the airport and your car is exposed to the dangers of being away from your garage. For More Information and pictures of other vehicles go to our special website www.DFWtoGalvestonCruiseBus.com. Consider Allpoints the next time you go Cruising! Well we all knew it was coming. The end of the Lincoln Town Car. Yes, the long time staple of the limousine industry is going the way of the dinosaur. The last Town Car rolled off of the assembly line August 31st 2011. Allpoints Limo will have to find another car to use for airport sedan service. To understand how this one must consider tha the Lincoln Town Car was the most successful airport transfer sedan for most of the last two decades. The reason is simple. It combined a large rear seating area with a huge trunk. The trunk was not just large but with the perfect fit size for suitcases behind the rear wheel wells you could put up to eight full size suitcases in the trunk plus several carry ons. Customers enjoyed ample leg room and a six-inch factory extended rear seating area was available. In addition to this the Lincoln Town Car was really just a Ford Crown Victoria with an upscale body. Any mechanical part would interchange with a $ 20,000.00 car so that parts were easy to buy at low prices. This meant that repair costs were very low. The 4.6 power plant was renown for heavy service without a complaint. At 20 plus miles per gallon, combined city and highway, many of these cars would go 350,000 miles without a new engine or transmission. Now that the Town Car is on the way out there are many pretender’s to the throne. At the 2012 LTC limo show in Las Vegas we saw the new line up from Lincoln and many new faces trying to become the new industry standard. Lincoln is pushing it MKT crossover as the go to vehicle for the future. It seats three easily and could fit four with three in the back seat. For the livery model they moved the rear seat back four inches and threw away the back fold down seats in favor of a larger baggage area. They even added the name “Town Car” along the door to underscore their history with the industry. Royal Cabot Coach Builder’s had a MKZ, the hybrid Lincoln sedan, available in a six-inch stretch. While the trunk is still smallish the rear seating area had almost as much room as an old Town Car. The 38 miles to the gallon sounds like a great deal for owners but the $ 51,000.00 price tag is a little steep for the livery business. Chrysler came with the 300 which has been around for several years but made no headway in the sedan industry due to a cramped rear seating area and a poor trunk. The rear wheel wells extend into the trunk making it narrow and the deck lid hinges extend down also using up room. A six-inch stretch version which came out this year will solve one of these two problems. The look has also improved with a more stylish smaller grill in front. At $ 30,500.00 it is the price champion. $ 41,500.00 for the stretched version. Mercedes displayed their 550 and 350 models. Both were fine cars but the price was a bit high for the livery business. The rear seating area was alright and the trunk was serviceable. However, if your clients have a large set of golf clubs they won’t be riding in this vehicle to a golfing vacation. Would you believe it these people were right across the carpet from mighty Mercedes and stood the comparison very well. The Equus sedan had all of the features and a $51,000.00 price tag and the Genesis sedan had all of the same room at a reasonable $38,000.00 tag. Does Toyota say limo? Well they think so and the Avalon was there with the big boys looking for an upset. This company has even followed Lincoln, Cadillac, and Chrysler’s lead with a 150,000 mile warranty. There is even a Hybrid model which boasts about 40 mpg. The price is right but does Toyota say luxury? We will have to watch this one. Cadillac was there with their new XTS sedan. With a fairly large trunk the bags will do better than the customer’s in the smallish rear seating area. A stretched version came out this year. This vehicle had been purchased by both Carey and AJL International in Dallas and seems to be holding its own. Allpoints is considering all of the above and will test new vehicles by renting them and testing them with our clients. It’s Prom season and students are exploring the options for that exciting evening dance. A big part of the evening is the Prom Limo or Limo Bus to the big event. Allpoints Limousines has been providing prom limos since 1997. We would like to offer some insights into the best and easiest practices for a fun and safe prom evening. A “Parental Consent” form must be signed by the parent who guarantees the booking with their credit card. This includes contact information during the rental time in case there is a problem. As your wedding approaches the complicated logistics involved in this exciting – and stressful event can become overwhelming. There is location to consider, the details of the ceremony, flowers, and OH MY! what to do about Limos and guest transportation! •The transportation needs for your event will be based on the number of people, the locations, the timing between ceremony and reception, etc., plus any special needs like airport pickups, guest/family age groups, special assistance for physically challenged loved ones, and many other factors. • Choose a company who can offer all of the vehicles to meet your needs, from Sedans to Limousines to Limo Buses and Mini Buses, to large Motor Coaches. •Allpoints Limousines will often provide complementary Transportation Captains at hotels and other locations to assist guests with finding and boarding vehicles in multi vehicle weddings. •Ask about any available wedding discounts or specials, as well as policies on deposits. •Be sure the quotes include all additional fees, like gratuity, fuel surcharges, tolls, etc. to avoid surprises. These are common in the industry but at Allpoints Limousines they are included! •Make your vendor decision based on their fleet and their reputation, not just the lowest price. •Once you book your reservation, be sure to review your confirmation for accuracy, and be aware of any penalties for changes or cancellations. •Allpoints Limos will always send a e-mail confirmation. Be sure to carefully read it so that you know the routing, dates and times are correct. •Your wedding event may also include Bachelor/Bachelorette parties, showers, airport transfers, wedding guest transfers, and other activities requiring transportation. •Consult your transportation provider about vehicle options for these other events, too. •Allpoints prides itself in the details such as specifically which entrance at a wedding location the limousine should be waiting. Many larger churches or venues have more than one entrance. •Allpoints also recommends that a member of the wedding party other than the bride, groom or parents be detailed to interact with the chauffeur. This delegates some of the duties and lowers the stress level. •Transfer any baggage to the limo during the reception if possible. This makes the grand departure go more smoothly. •Allpoints Limos provides bottled water when leaving the wedding location for the reception. You may well be thirsty after all of the photos. Champagne is provided for the grand departure. •Allpoints Limos also provides at no extra cost such items as a Red Carpet Runner, a “Just Married” sign for the departing limo, Wedding Signs for all other vehicles, and special wedding napkins in the limousine. AllpointsLimousines of Fort Worth would love to help with your wedding plans. And, we are pleased to offer a number of special discounts to our wedding clients. Call us today to let us help make your wedding a truly wonderful experience for you and your families! On Friday, June 25th at the Chantilly Ballroom of the Hilton Anatole Hotel in Dallas, Attorneys Serving the Community (ASC) held their 24th Annual Luncheon; this year’s event benefited YW Nurse-Family Partnership and raised over $140,000! Allpoints Limousines provided a four hour limousine Christmas Light Tour for the auction hosted at this event. The donation included four hours of light touring in Highland Park and Deerfield. Free sodas, ice, and snacks were provided in the package. Seating included up to eight passengers in a formal stretch limo. The donated service was available any evening, in December, except Christmas Eve. Dawn Stout was the winning bidder. The tour was held on the 19th of December. Attorneys Serving the Community (ASC) was established in 1987 when several Dallas women attorneys pooled their talents and interests and joined together in the spirit of community service. Now, ASC is a dynamic volunteer organization with more than 270 members – women lawyers and law students – from the Dallas/Fort Worth area. ASC has raised more than $2.4 million for local charities. With a mission to support local non-profit agencies serving women, children or families, ASC members raise funds by holding an annual luncheon. Previous guest speakers at the luncheon have included Texas Governor Ann Richards, Secretary of State Hillary Rodham Clinton, First Lady Barbara Bush, Dr. Joyce Brothers, opera legend Beverly Sills, environmentalist Erin Brockovich, author Carol Higgins Clark, Olympians Wilma Rudolph and Jackie Joyner-Kersee, and “Good Morning America” anchor Robin Roberts. Now in its 24th year, ASC owes its success to the strong commitment of its members and the support of area law firms, businesses and individuals to its charitable mission. YW Nurse-Family Partnership focuses on low-income, first-time mothers – a vulnerable population segment that often has limited access to good parenting role models. Young mothers-to-be voluntarily enroll as early as possible, with nurse home visits beginning ideally by the 16th week of pregnancy. Nurse Home Visitors and their clients make a two-and-one-half year commitment to each other, with 64 planned home visits between pregnancy and the child’s second birthday. – Preventive health and prenatal practices for the mother – helping her find appropriate prenatal care, improving her diet, and reducing her use of cigarettes, alcohol and illegal substances. – Health and development education and care for both mother and child – providing individualized parent coaching aimed at increasing awareness of specific child development milestones and behaviors, and encouraging parents to use praise and other nonviolent techniques. – Life coaching for the young mother and her family – enabling economic self-sufficiency among mothers by encouraging them to develop a vision for their own futures, stay in school, find employment and plan future pregnancies.